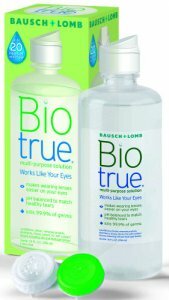 Biotrue helps keep lenses moist for up to 20 hours, maybe that's why 97% of people who have tried Biotrue are satisfied with it and prefer it 3:1 over the leading multi-purpose solution. 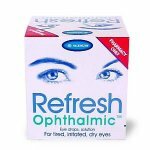 Uses a lubricant found naturally in your eyes. Matches the pH of healthy tears. 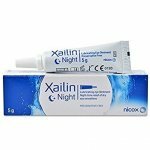 Can I use Biotrue with my soft contact lenses? Yes. Biotrue multi-purpose solution is for all soft contact lenses including silicone hydrogel lenses. Can Biotrue multi-purpose solution be used with extended and daily wear soft lenses? Yes. Biotrue multi-purpose solution is indicated for soft contact lenses including silicone hydrogel lenses. How long can you store your lenses in Biotrue multi-purpose solution? Contact lenses can be stored in Biotrue multi-purpose solution for up to 30 days in an unopened lens case. If stored longer than 30 days between wear, lenses will need to be cleaned and disinfected prior to use. What is the discard date of Biotrue multi-purpose solution? Discard any remaining solution 90 days after opening the bottle. Is Biotrue multi-purpose solution recommended for “No Rub”? Biotrue multi-purpose solution is indicated as a rub regimen, and this is the preferred method of cleaning recommended by eye care practitioners. Step 1: Place at least 3 drops of Biotrue multi-purpose solution on each side of lens surface and gently rub for 20 seconds. Step 2: Thoroughly rinse each side of the lens for 5 seconds with Biotrue multi-purpose solution. Step 3: Place cleaned contact lenses in the lens case and fill with fresh Biotrue multi-purpose solution. Soak at least 4 hours. Remember to always use fresh solution – discard solution from lens case after each use. Always follow your eye care professional’s instructions. 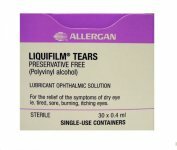 Based upon your own individual tear chemistry and lens-wearing schedule, your eye care professional may recommend additional products or procedures. You may store your lenses up to a maximum of 30 days in the unopened lens case. 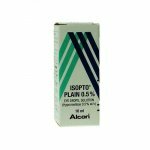 If stored longer than 30 days between wear, you need to follow the cleaning and disinfecting steps prior to lens insertion. Store at room temperature. Use before expiration date on printed on the carton and bottle. Discard any remaining solution 90 days after opening.